Lost Tribes Of Israel Study Maps 4 - Maps... each with text describing the migrations as detailed on each map. VOLUME I: THE PRE-EXODUS FLIGHTS. This volume examines the Zarahite reign in Egypt; they were known as Hyksos which means the Shepherd Kings. It covers the flights of this Zarah Branch of Judah and the sailing Tribe of Dan to Greece, Troy, Spain, Britain, Ireland, etc. Particular attention is paid to the Hebrew voyages of Danaus, Cadmus, Chalcol, Darda, Brutus and Corineus and the Danaans. Source material includes the ancient histories and legends of Egypt, Greece, Ireland and Britain. The reader will learn that the greatest Grecian stories such as Jason and the Argonauts and the famous Trojan War actually involved descendants of these first groups of Israelites that left Egypt prior to the Exodus. This volume also contains a basic history of Jacob's Pillar which is the Stone of Destiny used in British coronations. VOLUME II: DEPORTATIONS BY ASSYRIA. This volume introduces the reader to the House of Judah and the House of Israel. It examines the House of Israel's deportations to the Assyrian buffer zones. It covers their war with Urartu their breakaway from the buffers their conquests in Phrygia and Lydia their arrival at Arsareth Moesia and Scythia and their migrations to Scandinavia and Western Europe. Special attention is given to their changing names as discovered in the archives of Assyria on the monuments of Persia and in the writings of the ancient Greeks. Their names include Beth Khumri, Ghomri, Gimira, Cimmerians, Celts, Isaac, Isaaca, Iskuza, Sacae, Skuthae, Scythians, Germani and Saxons. VOLUME III: JEREMIAH'S JOURNEY. Volume III examines the history of the House of Judah with King David's perpetual throne. It traces Jeremiah's journey to plant the Hebrew Princess Tea Tephi in Ireland as found in Irish tales. It also takes a look at the Hebrew Milesians that were in Egypt during the reigns of Pharoahs Psamtik I and Hophra. The reader will follow Gallam the Milesian from Scythia to Egypt where he acquired the Hebrew Princess Scota; Gallam and Scota's voyage from Egypt to Spain; and the Milesian invasion of Ireland from Spain. The evidence will show that King David's dynasty survives today in Britain with Jacob's Pillar. 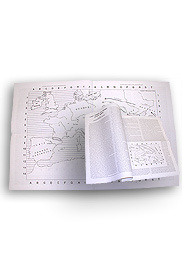 Each Study Map is folded to a handy 7 1/2" x 11 1/4" size. Also included is rigid flat envelope for extra protection! Another rare and valuable discovery offered by ARTISAN PUBLISHERS.